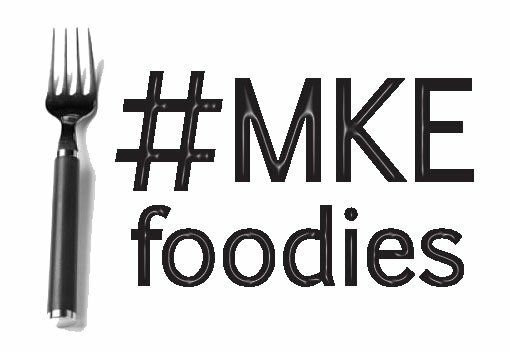 Proud to be an original member of #MKEFoodies! 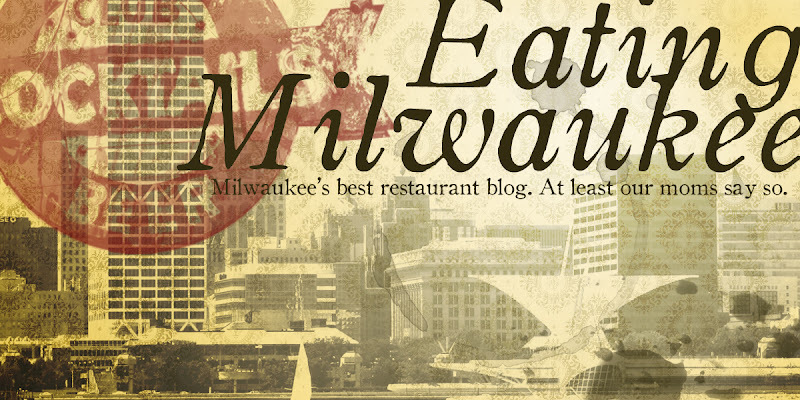 Eating Milwaukee is a food blog devoted to the best of Milwaukee's restaurants, specializing in off-the-beaten-path and ethnic foods. We're a group of food enthusiasts who love sampling new and interesting cuisines, and finding those hidden gems that our city is filled with. We eat without prejudice, and pledge to report honestly and with integrity. At Eating Milwaukee, we try our best to adhere to the ad-hoc Food Blog Code of Ethics, which is itself a version of the very official and very serious (no laughing!) Association of Food Journalists Food Critics' Guidlines. We're very proud of our strong reputation as a fair and honest restaurant-based food blog. We will not review chains. We eat at chains, we even like some chains, but we won't review them. Multiple locations of the same small business don't count. We like dives. We like clean dives even more. There is no cuisine that is off-limits with us. We're foodies, we like it all. With a few small exceptions, we'll try almost anything twice. 4) Don't take our word for it. Get out there and support local Milwaukee businesses! Copy and paste the URL from this image (just click on it and copy it from the address bar in your browser) to put an Eating Milwaukee badge on your site! Day one: I'm still not sure. 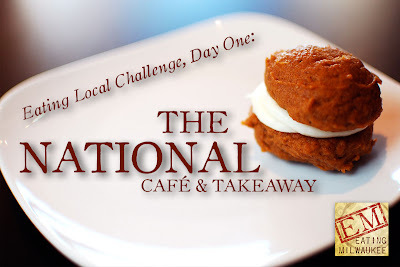 I'm not sure I know what I'm doing, I'm not sure if I'm doing it right, and I'm not sure if I deserved to be hyped as participating in the "Eat Local Challenge." I had a chimichanga from Grebe's at lunch today, and a hard roll from Sendik's for breakfast. Is that really making an effort? Is it too early (er, day one, Joe...) to start scolding myself? And what did I expect, after all, us being a restaurant blog? I'm not sure. I do know that I'm excited. I'm excited not so much in the Christmas Morning way, but more of the way you feel when you see a thunderhead on the horizon: still a little far off, but looming, dark, full of friction and electricity and entropy and excitement, and maybe a little danger, a little risk. Bringing the blog back online, bringing myself further into the fold of the food community in Milwaukee, and meeting people chipping away at making a difference, and finding out I'm a lot like them: this is very, very cool. Milwaukee, big things are comin' your way, girl. 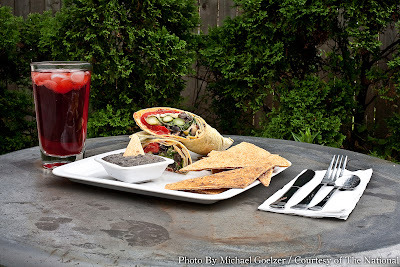 Get your hairs did and your nails painted, 'cause I can see a thunderhead on the horizon, and I feel like the Eat Local Challenge, food blogs, and #MKEFoodies is just the beginning. So, with that excitement, and my nagging lack of surety, I forged ahead to our first Eat Local Challenge Restaurant Of The Day (or ELCROTD, for short). If you've ever taken the National Avenue / 6th Street Exit from 94/43 to get to Walker's Point, you have undoubtedly driven past The National. Maybe you've even wondered what it is, with it's large swath of Cream City Brick bedecked in a painted mural. Maybe, you're like me: never in Walker's Point during The National's business hours (ahem). Maybe, you already know it and love it. We're going to hope that everyone, by the time the Eat Local Challenge is over, falls into the last category. 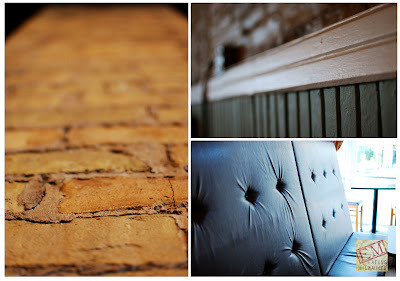 The interior of The National is requisite funky and mod, with art on the walls, cool lighting, big pleather banquettes, and some nice exposed brickwork. She told me how The National looks for every opportunity to bring in local ingredients, from the dairy and eggs in the bakery, to coffee, beers and sodas. Jean never set out to manage a restaurant, she told me. As a former case worker, she thrived on the interactions she had with the people she worked with, though, and the restaurant was a perfect fit for her. 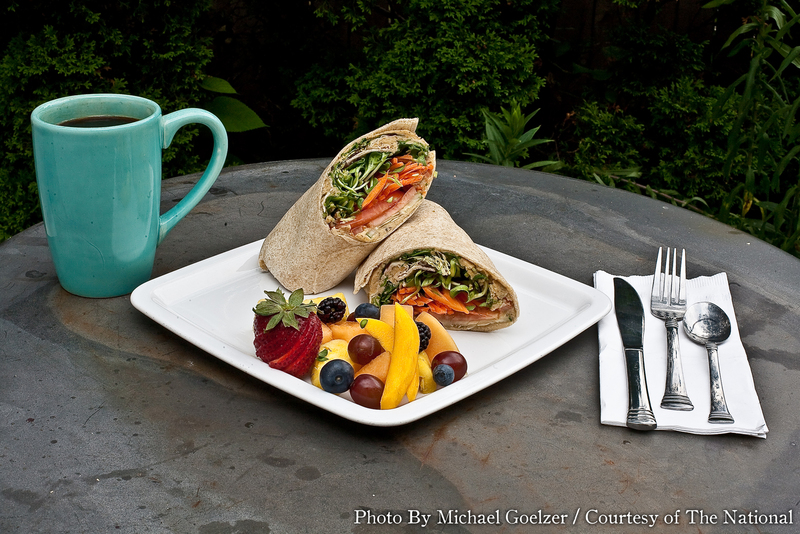 We chuckled about past jobs as she cracked eggs into a sauté pan, and told me about the tofu version of the burrito. "It's local tofu," she told me, "totally awesome." The holy mix of omelette, onions, peppers, local cheddar cheese, and the fabulous bean dip made for a fantastic snack on my empty stomach that night, and an awesome breakfast the next day. Yes, it really is that big. The accompanying salsa is bursting with onion and garlic, and made everyone in the office wonder if we had opened up a small produce stand betwixt the computers and BizHub. The greens were bright and excruciatingly fresh, topped off with the tart and romantic strawberries, and those darlings of Wisconsin summers, the big plump blueberries. The soup was a complete surprise: sharp and bold, creamy and chunky in the same instant. The walnuts gave a big, assertive body to the soup: when some co-workers tried it, they immediately commented, "tastes almost beefy!" Jean said in a justifiably proud tone, "How can you not love that machine?" I spent almost two hours talking to Jean, and we went on and on about everything: food, politics, life in general -- and I get the drift that our conversation wasn't an exception, rather the rule. 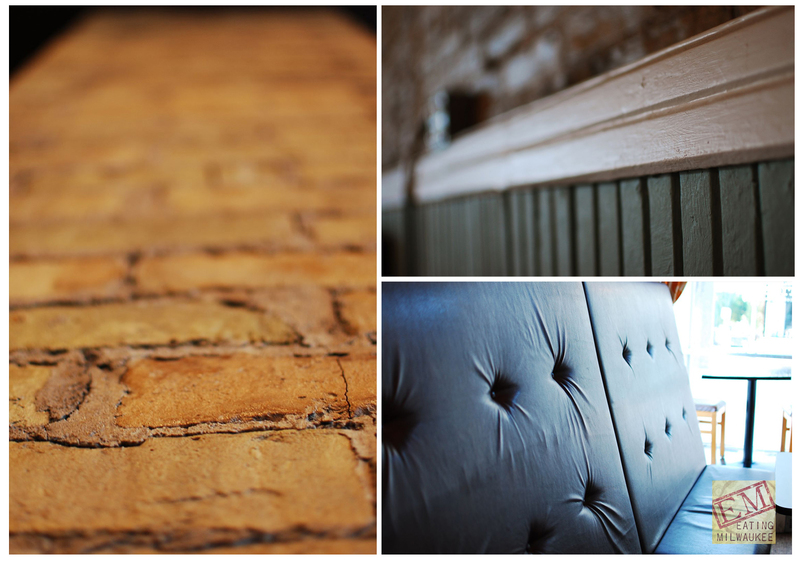 The folks at The National are passionate about what they do, the food they serve, the community they support. I walked in to The National not having a real clear idea about what I was going to ask, or how my time was going to actually play out. I left feeling like I had already made new friends, added new allies, and found a new favorite hang out. I wasn't so unsure anymore. I'm not sure I could have chosen a better way to start the challenge: manager Jean and owner Michael were so incredibly accommodating and enthusiastic, instead of questioning who exactly this rotund guy with a Nikon actually is, they welcomed me with open arms, and shared with me their unmistakable passion: making Milwaukee a better, happier, cooler place -- one breakfast burrito at a time. It was a blast to meet them, and an even bigger honor to highlight them here. Joe! Somehow I missed this article (ahem, probably because you never posted in on our Facebook wall, ahem). But the pictures are GORGEOUS! Thanks for all your great feedback and time we had together. Stop back again soon & we'll chat again. Any problems or concerns with the website should be reported immediately to admin@eatingmilwaukee.com.